We leisurely made our way to the port of Valdez and spent the evening relaxing and exploring the area. Our hotel was so close to the sea port and downtown Valdez strip. We enjoyed an evening boardwalk by the water as the breeze blew soothingly to calm our spirits. Delish menu...you can`t go wrong with their burritos. We looked up at the sky and spotted a double visual treat. Two bald eagles spread their wings majestically to claim the sky! The next day we packed up to head back to Anchorage (Boo!). We were determined to make one final stop before we turned our travelling toes back. Keystone Canyon, located about 20 mins. from Valdez, is a must see location in this area. Having spent many weekends exploring the waterfalls of New York State, we are naturally drawn to water. 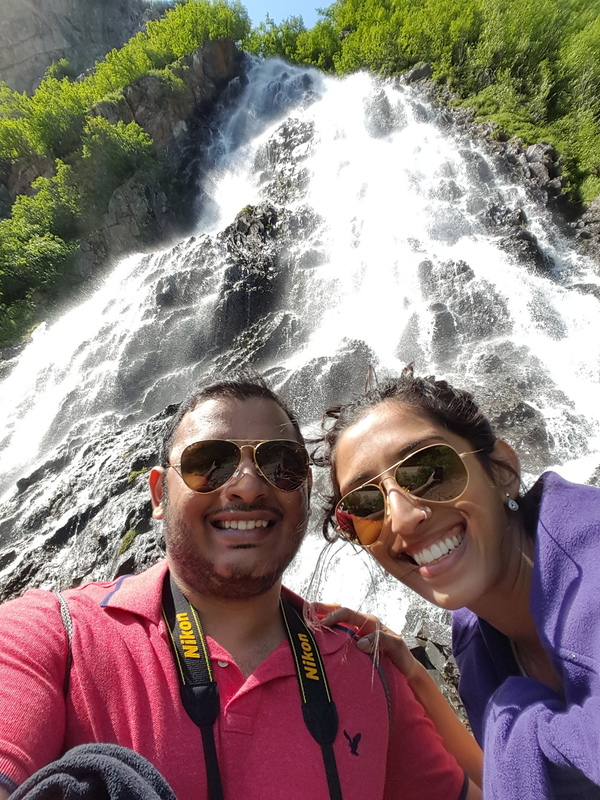 We were pleasantly surprised to see this great canyon with the amazing ‘Horse Tail Falls’ and the ‘Bridal Veil Falls’. We spent our last few hours listening to the sound of the gushing water, enjoying the warm sun that peeked out to warm us.